In my very first E-Book, The Perfect Fit Approach, I share just some of the knowledge and experience I have gained from working with hundreds of people during the past 10 years. I also share what works for me. 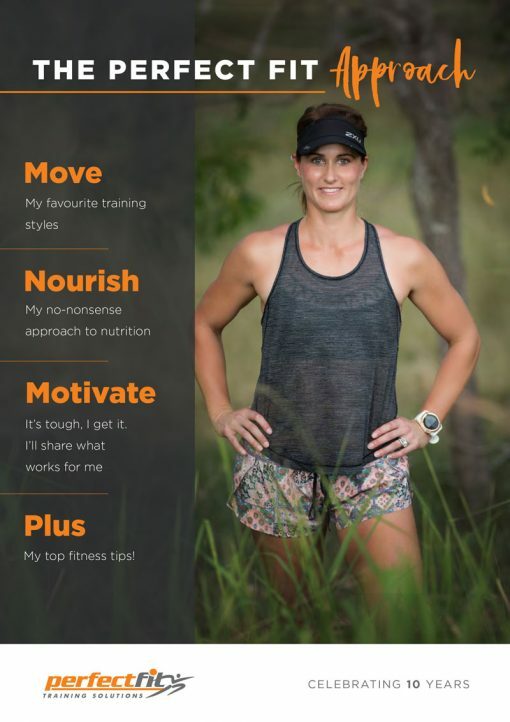 The 32 easy-to-follow, full colour pages are packed full of my top tips around movement, nourishment and motivation. This includes my favourite training styles, as well as bonus workouts, my no-nonsense approach to nutrition and some of my thoughts around motivation. This book isn’t about providing a quick fix, nor is it full of short-term weight loss solutions. It is about what you can do to achieve and stay at your ideal weight, optimal health and fitness for the course of your life. And this to me is better than any short term, short-lived achievement. The Perfect Fit Approach will entice even the most reluctant readers to lace up their joggers and take up the challenge of becoming fitter and healthier. So for the price of a cup of coffee, buy yourself this energy boosting read that will last a lot longer than any caffeine hit.